In Osten Ard, a land once ruled by the elf-like Sithi, the human king is dead. And when the Storm King seeks to regain his lost realm, a long dormant evil is unleashed, poisoning the land. Only a scattered group, the League of the Scroll, recognizes the danger. Only they know of the riddle of the long-lost swords of power, the one small hope of salvation. And to Simon, falls the search for the riddle's solution. EXCERPT - The alchemist's hand snaked down and grasped Breyugar's head. The count, who had been lying limp at his feet, suddenly lurched forward and away, leaving a startled Pyrates holding nothing but a bloodied hair. Simon watched helplessly as the pop-eyed Lord constable stumbled directly towards his hiding place; he dimly heard Pyrates' angry shouting. The close leaning night tightened around him choking his breath and blackening his vision as a pair of guards leaped after Breyugar. FL Speaks - Very few books have managed to bring a plethora of emotions within me. This is one such book. It all started as almost all heroic fantasy book start with...innocence and then duty and then realization. At times, i wish i never picked up the book and at times i felt like leaving it half way. But after the 3 days i needed to finish this, i am glad i stuck to it. Its a memorable, a tragic, an exciting journey of Simon. So many sad moments, so many hardships, so many fightback...this book makes you weep and crawl in fear. Near the end, when the young lad shouts in the face of death, 'I am.....Simon! ', i could feel goosebumps erupting all over me. Before i get carried away, the first book of the 'Memory, Sorrow and Thorn' saga starts with a young lad called Simon who became an apprentice to a certain Doctor Morgenes. Although the synopsis stated that he is a magician, i only saw him use magic once and that also at a tragic time. The King is Dead and his elder son, Elias, takes his place. This is as much a story of Elias and his brother Josua as it is of Simon. Josua is tortured by a priest called Pyrates who acts as a counselor to Elias until Simon and Morgenes manage to rescue him. Betrayed at the Castle, Simon is forced to flee and is met by a troll who becomes his guide and friend. As they make their way to the fortress of Naglimund...they are chased by Elias minions and its luck and bravery that keeps them alive. From Naglimund, it is revealed that they are to go in search of three legendary swords that can stop the coming madness, for Elias, is not who it seems he is anymore. The Storm King is awake and if Simon and his group is to fail, human race will be doomed forever. 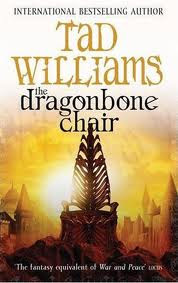 Tad Williams overdoes the first part of the book with lengthy narrations and less substance. Apprentice to a magician? Bah! i expected Simon to atleast say abracadabra or whatever sorcery there are, at least once. It looks like Simon is stuck at the wrong place, at the wrong time. But nevertheless, with dragons and the Sithi, Williams takes imagination to the skies yet again. With the amount of characters, Tad Williams can even put Erikson's "Gardens of the Moon" to shame. This book will test you to the limits and toy with your emotions before throwing you the raging storm in the final 300 pages. A good read. A must read for fans of high fantasy.